40ml Autosampler TOC Vials for Total Organic Carbon Testing and sampling. Each lot of vials is tested and certified to contribute <20 ppb TOC. A Certificate of Analysis is included. Low Level 40ml Autosampler TOC Vials for Total Organic Carbon Testing and sampling. 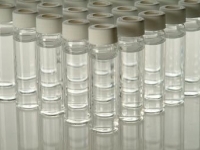 Each lot of vials is tested and certified to contribute <10 ppb TOC. A Certificate of Analysis is included.